To my dear sister, to all of you, salaam. And to my sister, who has two children in the ill-fated Camp Liberty waiting to be freed, to the president-elect, to the freedom fighter, to a woman of greatness and that is President-elect Maryam Rajavi. I want to share an appreciation for those who have come here to be with you. There are pastors who are in the Christian faith. I hope that they will stand up wherever they might be. I want you to know that they've come from America like the Reverend Max Miller of Mount Ibrahim Baptist Church and his wife. He heads up the Baptists Ministers Association with hundreds of ministers. Or the Reverend David Planch of the Greater Zion Missionary Baptist Church, who comes here, wanting to stand with you. Or the Bishop Sheldon Beady of Harvest Time, that come from the great state of Texas and from Arkansas and places beyond, they have come to stand with you. And so let me send this message to those who are seeking freedom in Camp Liberty who should be immediately returned to Camp Ashraf. I am speaking to my brothers and sisters in Camp Liberty and the children that are there. The children that I want to lead a free Iran. We will not abandon you. We are going to be with you and you're going to be free. The Iranian Resistance is the inheritor of the great golden age of Persia, when you celebrated liberty, when your whole social fabric was about religious and social freedom. You are the ancestors. You are the ones who are the people who have come out of that great legacy. You are the ones who Queen Ester Hadassah who was able to talk about freedom or Cyrus who freed the Jews. You are they. We cannot tolerate a lack of freedom. Your struggle is my struggle. And the brutality of last week's attack [against Camp Liberty], please understand that there is no divide between those in the United States who would condemn the dastardly and brutality of [the attack against Camp Liberty] last week, including the Secretary of State, who denounced it and whose heart and mind recognizes that we must free those who are struggling in Camp Liberty. Free them. Let them go on to Camp Ashraf. Now I have been with you. I am reminded of the many hours on the floor of the House where speeches begging for the MEK to be removed from the terrorist list. I remember like you the attacks, the disparaging remarks. “Sheila Jackson Lee is a terrorist.” But I was not going to be moved because when you are right and you stand with the great history of the people of the Iranian resistance you cannot be moved. I want you to understand that the Iranian Resistance, which has gathered here from all over the world, is proud and tolerant. You will not concede to the abduction and brutal murder that occurred to the president of the Iraqi Women's Syndicate who was assassinated because she was a fierce opponent of the Iranian's regime deliberate intrusion in the lives in the Iraqi political, social and economic systems. And so it is our challenge and our duty to be able to stand up for those fallen soldiers, men and women, who are no longer here to tell the story. Many of you remember, and my heart is still pierced because I remember this young college woman lying in the streets of Tehran, many of you remember that, with blood around her. I will never, never forget nor will I forget the sisters that have come to me in Congress and in the United States to tell me of their children. I want them to know all of you that you will see your loved ones out of that camp for those that have died will not die in vain. We will see them come and they will be free. The Iranian Resistance celebrates the prosperity of women, minorities, and cultural and religious institutions, unlike the government today that focuses on oppression, that closes the oldest Christian church and puts pastors in jail. We are an innovative people recognizing that our history is intertwined into liberty and justice and freedom. America's values are your values, and don't give up because we will not give up. Call us terrorists, call us freedom fighters, we will not be daunted by words. We are ready to fight for freedom. 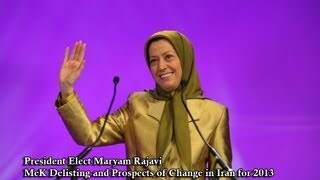 I join with President-elect Rajavi that all women must have equal rights. As a member of the House Judiciary Committee I join with her in an independent separate court system that is not influenced by the religious community to give an unfair justice in term of whatever religion you are if they don't like it you don't get justice. We want a system that is pure that respects all religions. As I said to you, we started this journey with a number of my friends here some very long time ago. 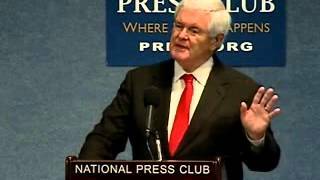 In addition to the floor speeches many of you know that I've called and call our leaders, when we were fighting, to be able to remove the MEK off of the terrorist list. We wrote letters. We talked to the secretary of state. You filed law suits that we supported. And of course I remember in dealing with the early stages of Camp Ashraf talking to the special envoy two and three and four in the morning. Not because I'm a member of the United States Congress but because it was right. My heart was there. You deserve it and we have to stand like that no matter what time we are called on to stand. And so I say to you, I am here for you. But I’m mostly here for the children. As I went down this row and shook hands, tears were in my eyes to be able to see the children. Because it is my promise, as my colleagues promise you today, that one, I know that as we leave for Washington, we will be calling in a loud voice, as we have done in the resolution that I have supported along with the author, we will be calling on the safe passage of those in Camp Liberty to go where they can be replaced. You are from all over the world, from Europe, from the United States, South and Central American and places beyond, you have the ability to come and bring these people safely to you. You should not be denied. But yet the people should not be discouraged that if they're in Camp Liberty and moved to Camp Ashraf that they are not the inheritors of the real Iran and the real liberty. They must be able to go to Iran and lead that government safely and securely. I am here for the children. 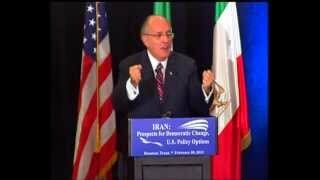 And so on behalf of the United States Congress we are here to support a democracy movement in Iran. We support the organized resistance by women, students, youth and other sectors of this society, and we support the Iranian Resistance and we step away from claims of extremism, for that is not the case. We will call for international pressure, including diplomatic, military and oil sanctions on all of those who will get in your way. We will call on the leadership of Iraq to own up to what is right and what is just. Let them hear our voices. We have sacrificed the lives of young men and women of the United States of America in the battle. We want Iraq to live up to its promise and free the people of Camp Liberty and let them live in freedom and justice. To go back to Ashraf and to be able to be free. And so my friends I did not come this long distance to not convince you that you're not alone. And I leave you with the understanding that we are together in unity in the United Sates. And that you can take pride in the fact when someone asks what difference did you make. And you can say as you look to the voices that you will hear, you've made a magnificent difference. And again as those of us who lived through challenging times in America, and were able to rise in the sun with Dr. Martin Luther King, who understood that it is all about America's values, it is in fact to be able to recount for you in my final words that when he sat in a jail in Birmingham he wrote a letter to those who accused him of being an agitator, who should go away. And this is my final entreat and challenge to you, and it is one that I take home in my heart. He said these simple words. "Injustice anywhere is injustice everywhere." If there is injustice in Camp Ashraf the world must stand with you and as they stand with you, we shall overcome. We shall overcome. We shall overcome.